Thank you to everyone who attended the 2017 Winter Meeting! 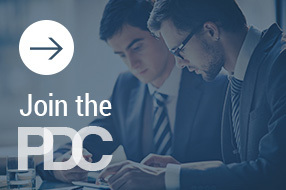 Join us on November 29th at the PDC Winter Meeting to connect and share with colleagues as industry experts focus our conversations on PD for the legal industry’s PD professional. We will spend the day critically and constructively reflecting on what each of us should do to maximize our impact and add value during these times of innovation and disruption in the legal industry. Our goal is for you to leave feeling reinvigorated about the opportunities that lay ahead for you in the brave new world of PD in the legal industry! Advanced registration is now closed. To register for the PDC Winter Meeting, please visit the registration desk located in the foyer of the Oriental Ballroom. Sightlines and Insights: Perspectives on the Future of Legal Professional Development - Panelists: Donald Prophete, Constangy Prophete; Kellye Walker, Huntington Ingalls Industries; Keba Gordon, Whirlpool Corporation; Marvin Mendoza, PwC; Moderated by: Werten Bellamy, Stakeholders, Inc.
NALP has secured a block of rooms at the Mandarin Oriental and PDC Winter Meeting attendees can take advantage of this special room rate. We recommend that you register early. The room block tends to fill up quickly and once the block is full (or after the cutoff date of November 7, whichever comes first), hotel rooms are subject to availability. The hotel room rate at the Mandarin Oriental Hotel is $275 (plus 14.5% tax) per night based on single or double occupancy. Book your room! Full refund for cancellations received by November 3 minus a $100 cancellation fee. 50% refund for cancellations received November 4-10. No refunds after November 11. Thank you to our 2017 Winter Meeting Planning Committee! Michelle Wimes, Ogletree, Deakins, Nash, Smoak & Stewart, P.C.